EpicDuel - Game Design Notes: Heroic Housing Winners! 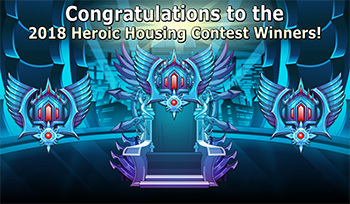 First of all, I want to extend my appreciation and thanks to everyone who participated in the EpicDuel Heroic Housing Contest 2018! I also want to thank our judges who took their time to collect all the entries and tally the votes. We had a tremendous response to this contest with over 100 entries! Many of them were exceptionally creative, and it was very difficult to narrow down the list to 25 winners. We considered many factors when selecting winners including color schemes, patterns, function, and overall creative effort put into the house design. The winners will be receiving 5000 Artix Points, a rare Achievement in EpicDuel, and 2 new home items! If you weren't among the winners, please be good sports to the winners and judges, even if you disagree strongly with our decisions. There will definitely be more contests to enter! Without further ado, presented in no particular order, here are your winners! I ask that winners of the contest please not change your house ( other than maybe adding your trophies ) for a few weeks, so that visitors may see your epic house creation! Also as a heads up, it may take a few hours or so before you receive your achievement, trophies, and Artix points because we need to add it manually onto your characters.